Naked broadband provider Bigpipe has extended its national reach, announcing today, the launch of its unlimited UFB offering into Wellington. The Spark Venture business is giving Wellingtonians the choice of three Ultra-Fast Broadband (UFB) plans, including the 200Mbps download/200Mbps upload offering, one of the fastest available for customers in Wellington. The launch of UFB into Wellington kicks off a targeted growth plan with the ISP set to roll out its Fibre offering into four other major New Zealand centres including Christchurch, Dunedin, Hamilton and Palmerston North. 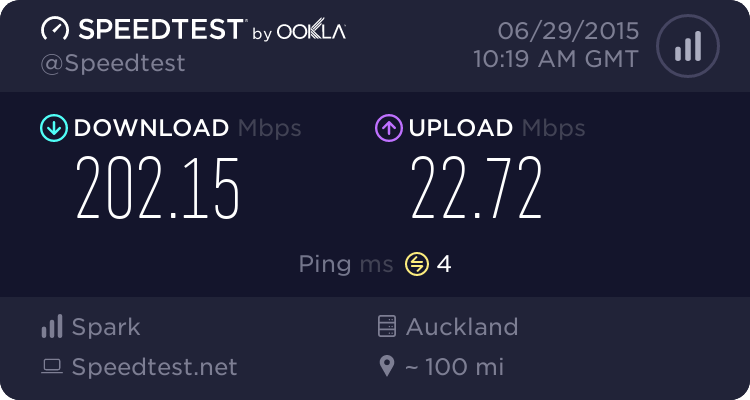 Oliver Smith, Head of Bigpipe, says Kiwi consumers expect high speed internet connection even during peak periods, and Bigpipe has proven its ability to deliver on this front, even with the launch of bandwidth intensive video streaming services like Lightbox and Netflix. The March 2015 Truenet report showed Bigpipe as the least congested network at peak times, compared with other ISP’s that dropped. “We maintained our position throughout with 98% speed obtained at peak times and we’re thrilled to deliver a consistently great service to our customers in Auckland and now in Wellington,” says Oliver Smith. The three plans Bigpipe is launching will offer the same benefits their standard plans do – unlimited data, no landline needed, dedicated online support, and no term contracts – with the choice of upload/download speeds aligned to varying levels of investment. “We are excited to offer Wellington, the opportunity to get the best download and upload speeds with unlimited data - the way the internet is meant to be enjoyed,” says Smith. Just FYI everyone, the address checker database for Wellington is not quite sorted yet, so may not show your address as having it available even though it actually is. If other ISPs or the chorus site ( https://www.chorus.co.nz/maps) says you can get UFB with them in wellington, then virtually guaranteed you can get it with us. just drop our team a note through the support page and they will help you sign up for UFB. Lias: Will "Wellington" include Kapiti? Hopefully this is one step closer. Hope the launch in welly goes well! Has @sbiddle got fibre yet? Or did Chorus skip his address? EDIT: Related question: If I pay the static IP fee while on DSL, will that cross over when upgrading to fibre? Yes. But you'll get a different IP when you switch access technologies.